I know you were not going to be able to function this weekend without getting an answer to the question. But Jerry West, new advisor to Golden State Warriors ownership, will be continuing on with his Northern Trust Open Executive Director duties according to the PGA Tour. CHICAGO and PONTE VEDRA BEACH, Fla. – The PGA TOUR and Northern Trust (Nasdaq: NTRS) today announced a four-year sponsorship extension for the Northern Trust Open at Riviera Country Club in Los Angeles through 2016. Northern Trust’s original five-year agreement expires after the 2012 tournament. That Nasdaq symbol helped. Much appreciated, even though we all had it memorized. particularly with the addition and leadership of Jerry West as Executive Director. With today’s announcement of Northern Trust’s four-year extension, the tournament undoubtedly is going to continue to grow and have a positive influence on the Los Angeles area." While the charitable impact of the 2011 tournament has yet to be announced, last year’s Northern Trust Open generated nearly $1.5 million. Since Northern Trust’s title sponsorship began, the tournament has raised more than $5 million. "We are proud to renew our commitment to the Northern Trust Open," said Northern Trust Chairman and Chief Executive Officer Frederick H. Waddell. "This is a terrific event that attracts the world’s best professional golfers while supporting our business goals. The Northern Trust Open provides a premiere event for clients, improves brand awareness, and helps the community by generating substantial charitable donations and economic activity." Yes, for The Golf Channel. 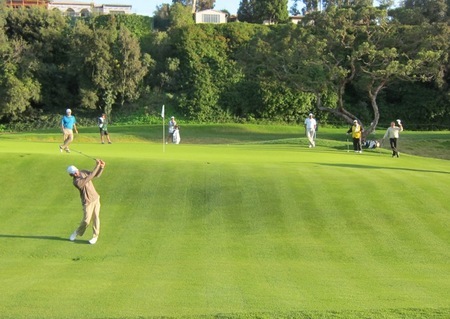 A study commissioned last year by the PGA TOUR with Beacon Economics showed the Northern Trust Open is responsible for an economic impact of more than $21 million on Los Angeles County. The impact includes the equivalent of 201 full-time jobs for a year created by the event, with earnings of approximately $7.4 million and local tax revenues of $350,000. And now for Jerry West's quote, in the voice of David Pillsbury. "Northern Trust is an engaged, committed, passionate title sponsor, and the organization’s leadership has helped reestablish the tournament as a major sporting event in Los Angeles," said Jerry West, Northern Trust Open executive director. "Northern Trust's continued commitment will help the tournament continue to grow and make a bigger difference in the lives of our neighbors in need." "This one here, the week can become so short." Doug Ferguson looks at the players' love-hate relationship with match play and there appears to be much more disdain than affection. Oddly though, the match play duels sound less like the issue, and the embarrassment of a possible one-and-done situation is the real culprit. I see on the Twittersphere that Kevin Na is taking a beating for his Sunday pace at Riviera, but I must say that J.B. Holmes, who played in the last group Saturday, may actually be slower. He definitely is on the greens. But that's beside the point. I know television rules the world, but I took such joy watching an incident unfold more than once over the weekend, most notably on the 14th tee. Baddelay approaches 18 with a real, honest to goodness gallery (click to enlarge)People! What a miracle seeing live bodies return to the fairways Sunday in a retro L.A. Northern Trust Open finale thanks to fan-favorite Fred Couples and cooperative weather. The attendance figure never did make it in my hands but I'm sure it topped last year's 30,000 number. Kevin Na has his caddy line him up on tee and fairway shots. I can deal with that. But the plumb-bob putt reading does not belong on the PGA Tour. These Guys Are (Slightly) Faster! Five hours and 17 minutes for the Northern Trust Open final round, breaking Saturday's five hour and 20 minute marathon. The people were heard. This one has possible train wreck/last man standing written all over it. Either way, I'm leaving it up to you to report what you see and, in small doses, what you hear. 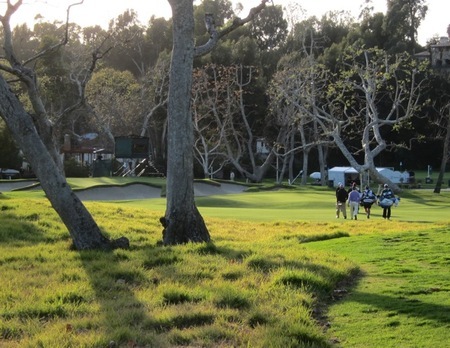 2011 Northern Trust Open: These Guys Are Getting Slower! Five hours and twenty minutes for the leading threesomes to play their NoTrust Open rounds in cool, sometimes showery conditions? Reader Tom saw Doug Ferguson's Tweet of my very, very brief media room siesta--John Strege thinks I was only out one minute--and suggested this one needs a caption. To help jumpstart your creative juices, this occurred around 2:00 when Saturday's third round was laboring, the skies were opening up, the heater was working particularly well, the sweet potato side dish was taking over and I was dreaming of what fascinating things CBS guys might have been saying about Riviera. "He never uses it as an excuse, but I'll tell you flat-out it's worse than people know." The scribes enjoyed Freddie's post-round press conference so much, they wrote about it, starting with Bill Dwyre. "Dude, you can't come up like that in the middle of the round." Doug Ferguson offers more details on the Jim Gray incident. I think they're pretty solid, since he was standing there when Johnson's caddy and Gray opted to pass on the chit-chat and get right to the fun stuff. "I even got a text from Tiger. He says hi, so I texted him back when I was coming down here. I said, I do love this place, but if you played here you'd win ten times, and he didn't send me too polite a text after that." Fans could listen in on Geoff Ogilvy and Squirrel discussing options (click to enlarge)A glorious day at Riviera and while the gallery was meager compared to the glory days of the 90's, an improvement over last year. Though the surroundings are special and the opportunity to walk a course of Riviera's stature are a treat, I was struck several times at just what a different spectating experience older courses provide compared to a TPC. 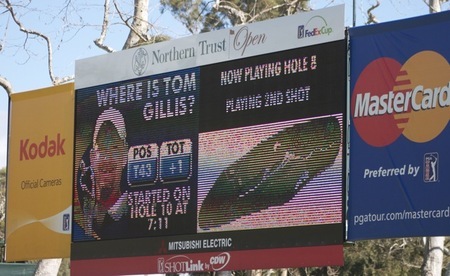 Sure, the sight lines are not as great when the gallery swells and amphitheater or grandstand seating is not available, but the ability to get close to players and eavesdrop on conversations when they hit wayward drives is unlike anything else in sport. The PGA Tour noted this in its clever Sunday newspaper wrap, and it's something they need to continue to drive home when possible. Even with no wind and pristine conditions, Riviera held its own thanks to sneaky fast greens, the vagaries of kikuyu and some thought provoking hole locations. Doug Ferguson reports on the wacky 9-way tie for first, while John Strege filed blog posts on Bubba Watson's WD and Bob Harig reports on Dustin Johnson's 2-stroke lateness penalty. And as noted previously, there was Anthony Kim's truly terrible luck. A few other images from our last day of sun until Sunday. There was a holdup today when Anthony Kim had to return to the second fairway while Phil Mickelson, Paul Casey and Luke Donald waited for him to hit his second approach following a freak occurrence. Stephanie Wei has all of the details and crime scene photos and I have posted a video detailing what could be one of the goofiest breaks I've ever seen. Not to mention another reason to deplore concrete paths. "Maybe that’s the ultimate compliment for any architect, or maybe it’s an indictment of the modern game that gems like Riviera’s 10th have gone the way of the Dodo." Today's look, with a few glitches, at the par-3 6th hole which features some new short grass behind the green. At the end of last year many of you requested more posts on architecture. So I took my iPhone out to Riviera Monday and shot this four minute look at the 434-yard fifth hole, one of my favorites and one of the few that hasn't been tinkered with too much in recent years.